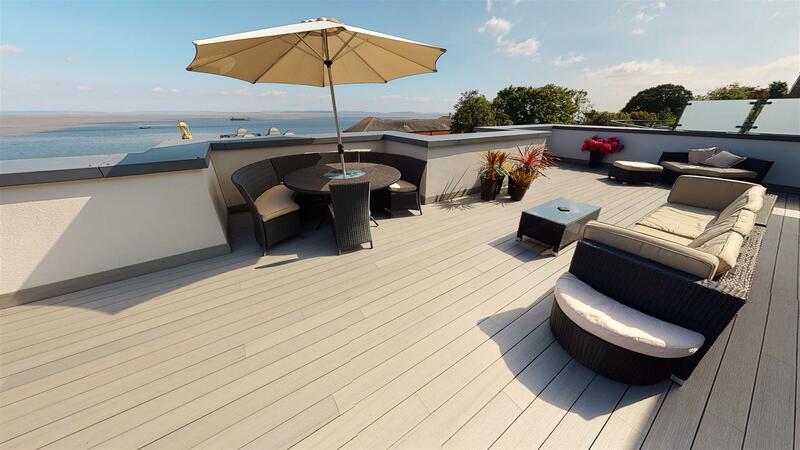 Stunning Penthouse apartment with superb views of the Bristol Channel and Somerset Coast. 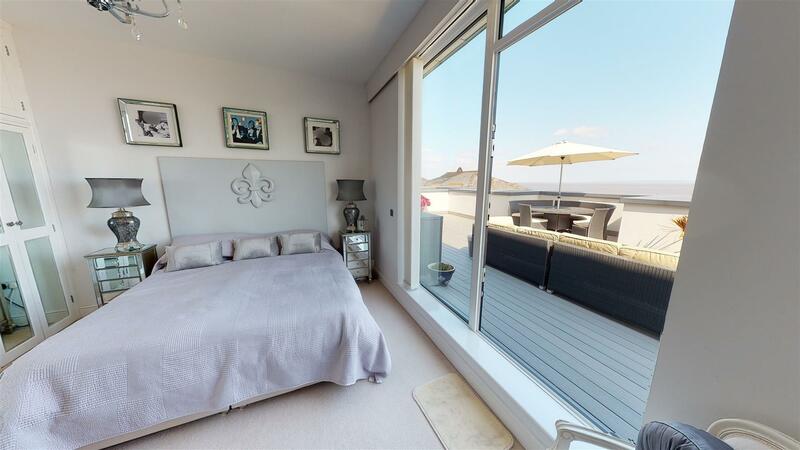 Presented to a very high standard throughout and offering excellent accommodation with secure entry and gated parking, two allocated parking bays. 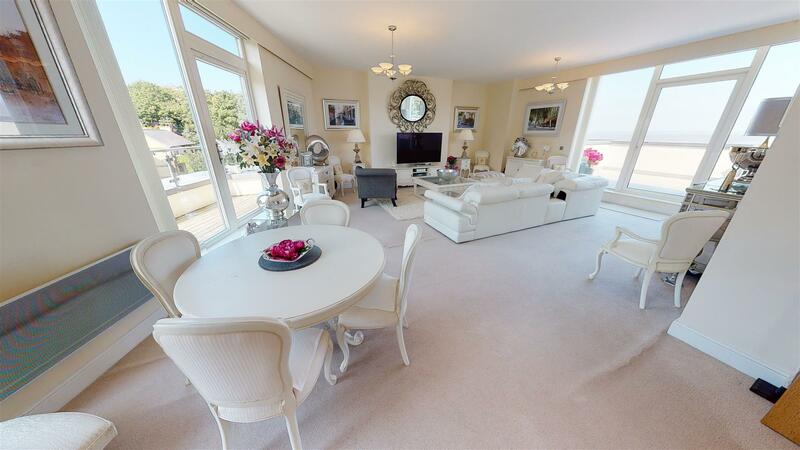 The large dual aspect open plan lounge/dining room benefits from access to balconies on both sides, one overlooking the sea and the other towards Alexandra Park. 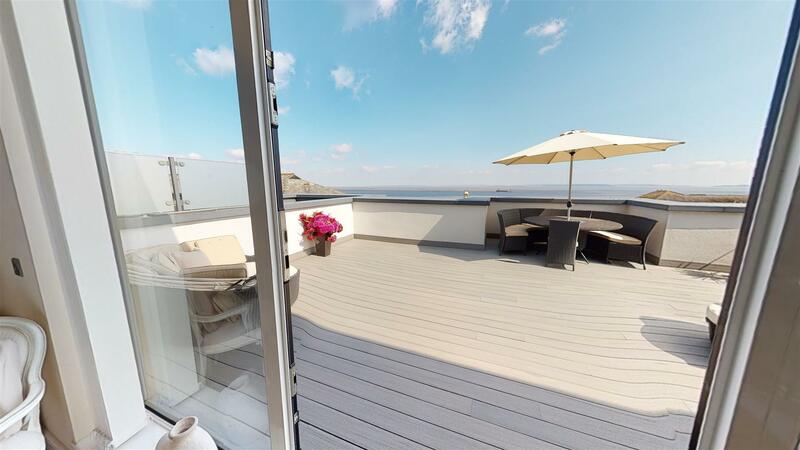 The sizable terrace facing the sea is also accessed from the master bedroom, bedroom two faces the rear and has access to the balcony facing the park. 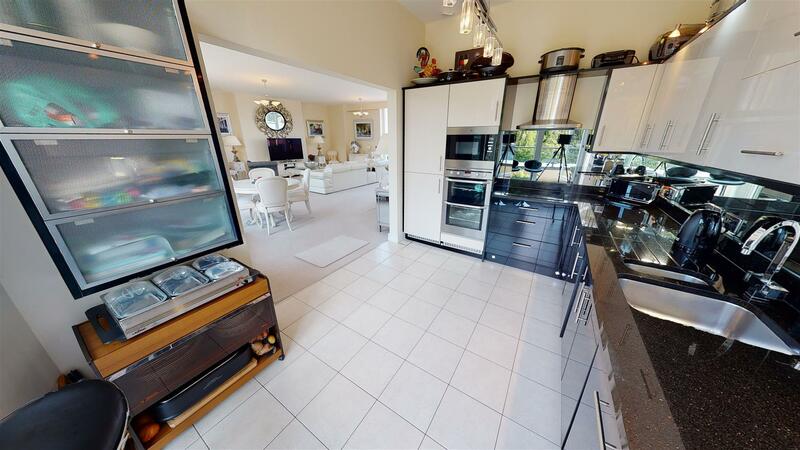 The high spec kitchen has fully integrated appliances and is accessed via the lounge. En-suite to master bedroom and bedroom two. 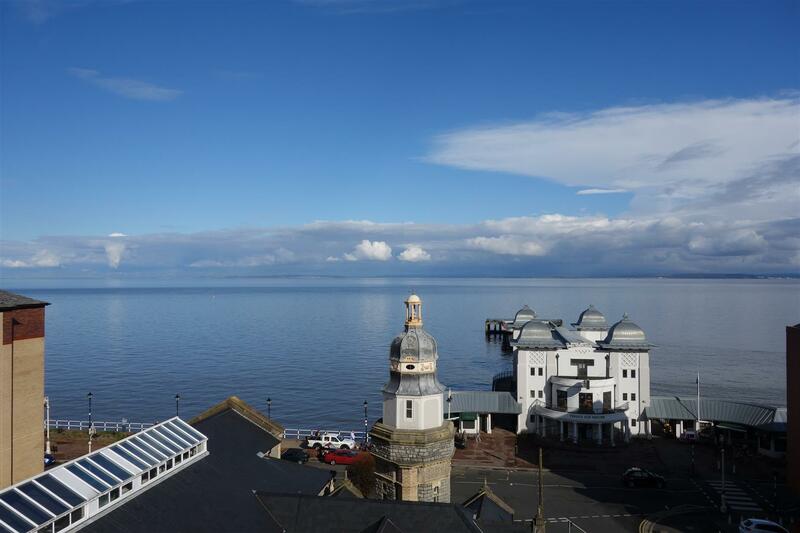 Penarth Esplanade has been significantly developed over the last couple of years and now boasts a Michelin star restaurant, cafes, and a Cinema on the Victorian Pier. The Town centre with its train station and amenities is only a short walk through Alexandra Park with its ornamental gardens. 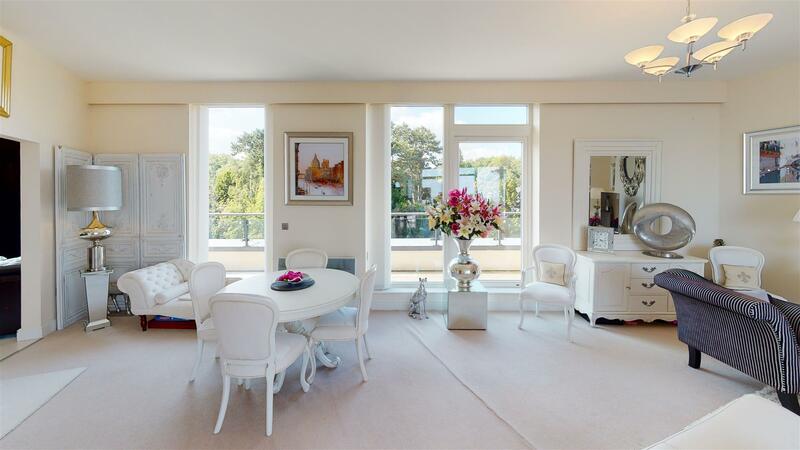 Viewing is highly recommended for this well appointed and impressive apartment. Secure keypad entry. Lift and stairs to all floors. Communal hallway leads to the apartment on the top (4th) floor. Entered via a solid wood door with spyhole. Door entry phone. Wooden double doors to storage cupboard with shelf and housing fuse box. Airing cupboard housing hot water cylinder, some storage space. Ceiling lights. Doors to all rooms. 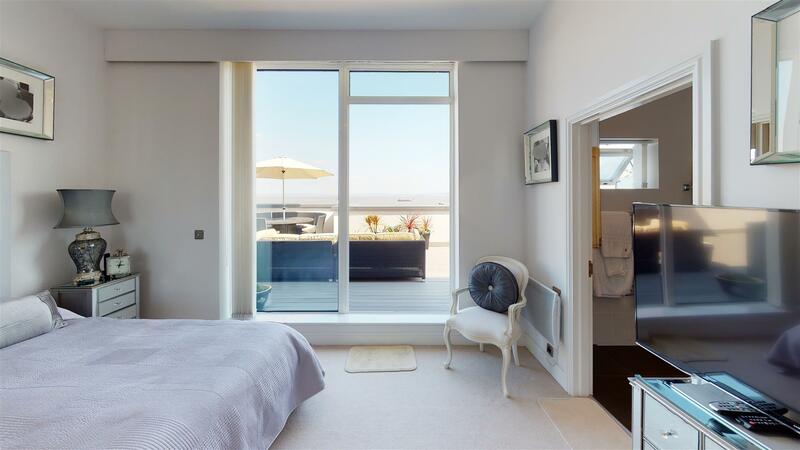 Large open plan reception room, dual aspect with double glazed windows and doors with access to a decked balcony to the rear overlooking Alexandra Park and with access to a large decked terrace on the coast side with far reaching sea views stretching to the Somerset coast. Wall mounted panel heaters. Ceiling lights. Archway into the kitchen. 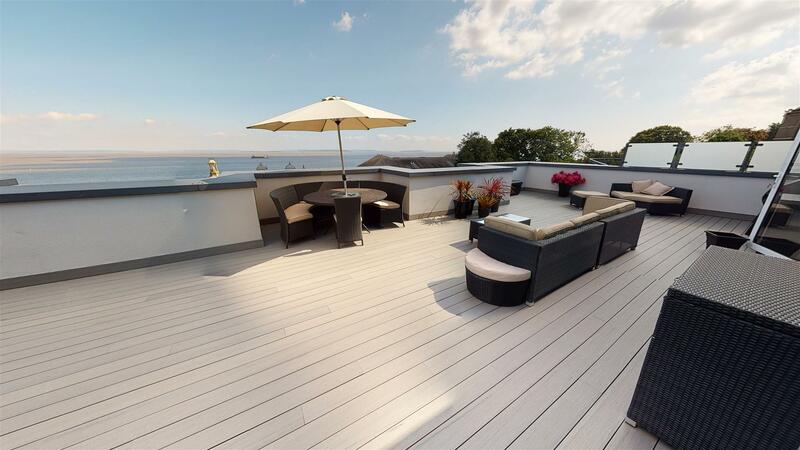 Fitted with a comprehensive range of wall and base units with black and cream gloss finish. Black granite work surfaces incorporating a one and half bowl sink unit with mixer tap over. 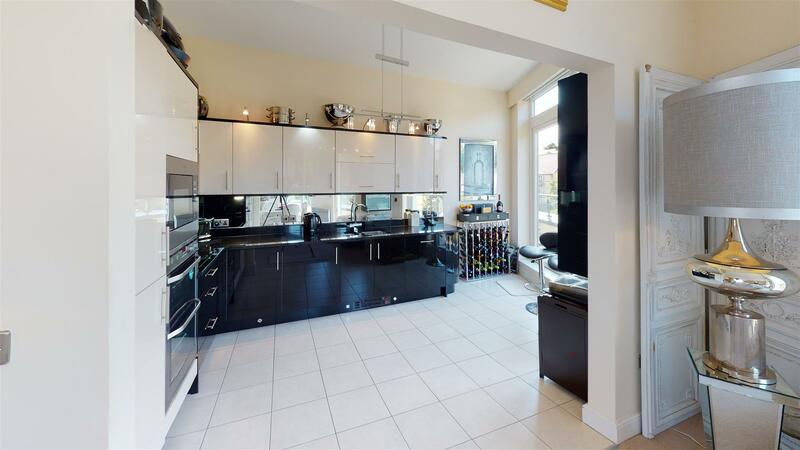 Integrated appliances include a four ring ceramic hob with extractor fan over. 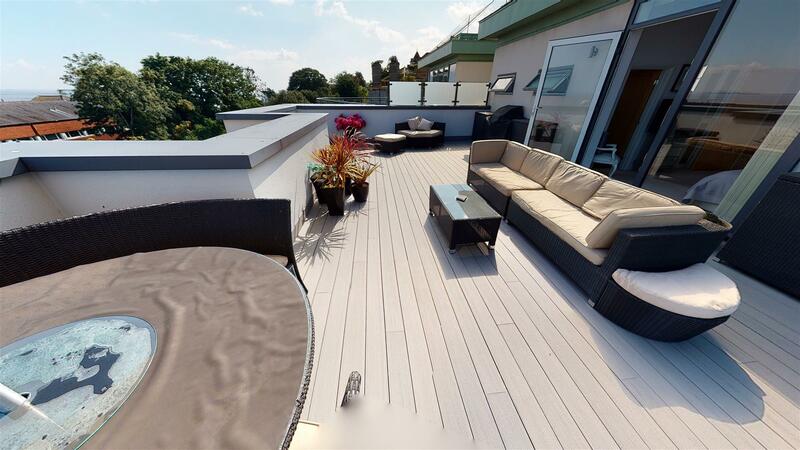 Integrated appliances include dishwasher, fridge, freezer, washer/dryer, electric double oven and microwave. Tiled flooring. Task lighting and ceiling lights. 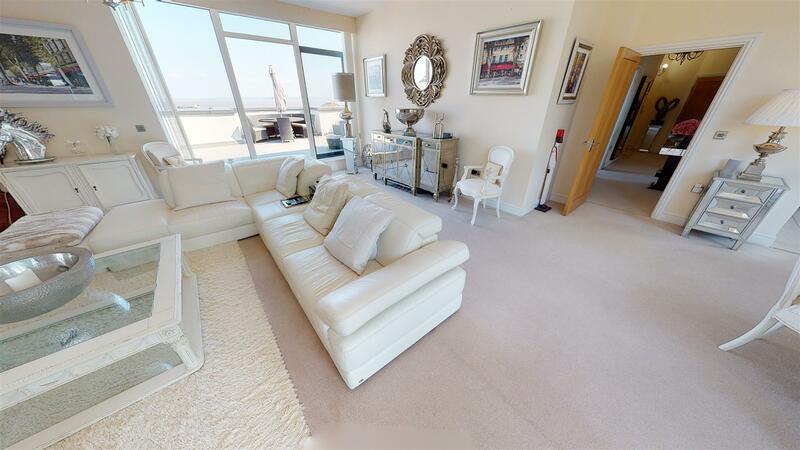 Double glazed window and door with access to a large decked terrace and with superb sea views across Penarth Pier and to the Somerset coast, also accessed from the lounge. Fitted wardrobes with shelving and hanging space. Ceiling light. Wall mounted panel heater. Door to en-suite. Fitted with a suite comprising, P shaped shower bath with chrome shower fittings over. Folding glass shower screen. Tiled bath/shower area. Wooden vanity shelf with drawer unit and wash hand basin. Low level w.c. Tiled splashback. Tiled flooring. Shaver point. Obscured double glazed window to front aspect. Chromed heated towel rail. Mirror fronted bathroom cabinet and with space for freestanding unit. Flush fitting ceiling spot lights. 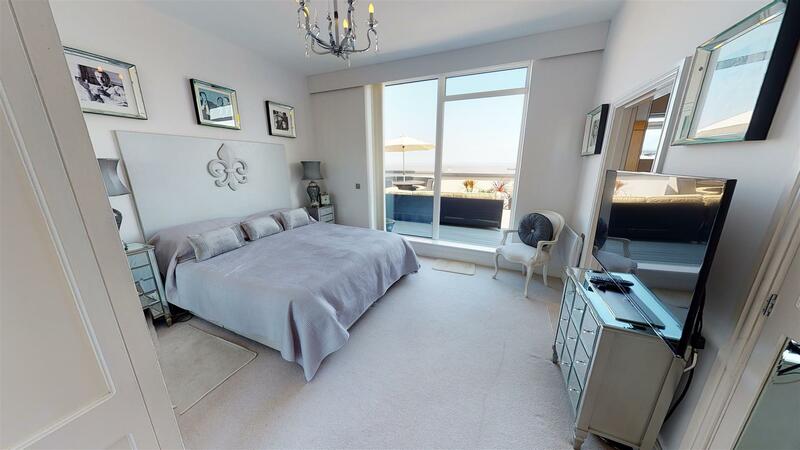 Second double bedroom. Fitted wardrobes with shelving and hanging space. Ceiling light. Wall mounted panel heater. 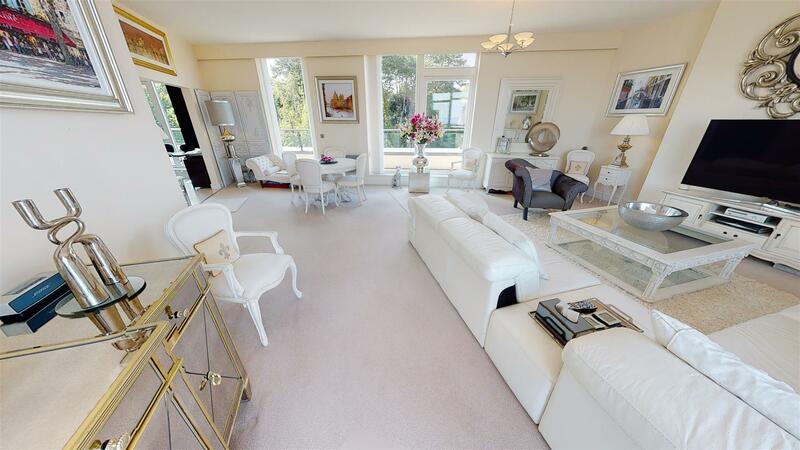 Double glazed door leading to a decked balcony to the rear aspect overlooking Alexandra Park and running the length of the apartment, also accessed from the lounge. Door to the en-suite shower room. Fitted with a fully tiled shower enclosure with chrome fittings and sliding glass door. Wash hand basin and w.c. with recessed cistern. Tiled flooring. Tiled splashbacks. Mirror fronted bathroom cabinet. Light over. Shaver point. Chrome heated towel rail. Flush fitting ceiling spot lights. 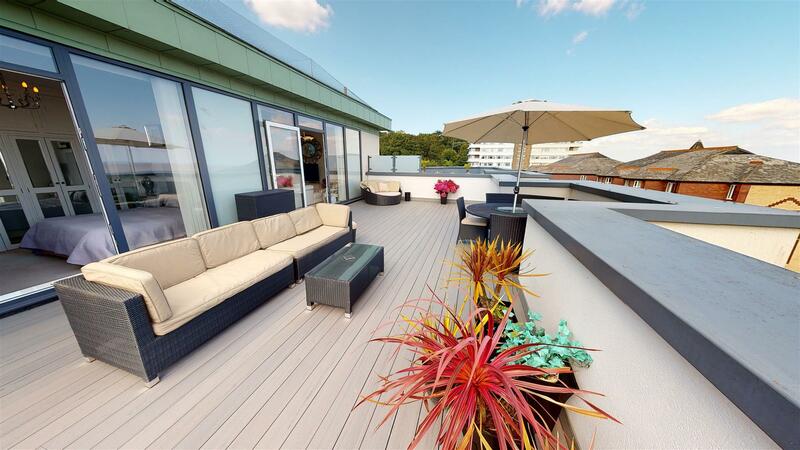 Secure gated undercroft parking with two allocated parking bays.